Here, on our site you will be able to take a trip down memory lane and see what advertising for every day products was like over the past 100 years. 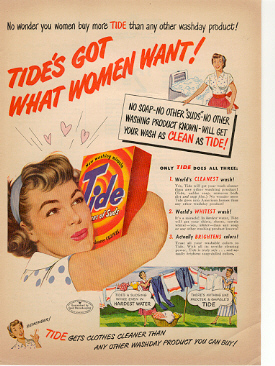 Alot has changed over time and the nostalgia of the vintage advertisements we have to offer can take you back in time. Our goal is to keep American History alive. We feel that by sharing our passion for these vintage advertisements we can show the people of today the advancements we have made with time. Here, at CCPLACE Vintage Advertisements we specialize in Agricultural items, such as tractors, implements and other farm mechanics. We also have many other miscellaneous advertisements for all products available then and now. All of our advertisements are original magazine ads and vary in size and condition. These ads make great conversation pieces for any home, shop or office. Have an antique item and want an ad? Email us! Here are some of the Agricultural Ads we currently have available. Original ad measures 8 1/2" x 11". 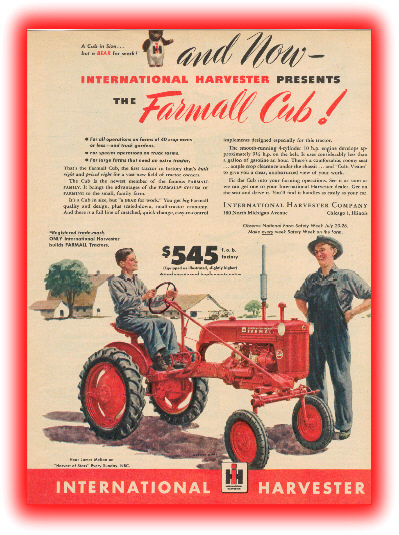 Farmall Cub priced in 1947 at 545.00. If you are looking for a particular product ad, all you have to do is ask. We would be more than glad to search our inventory for you. Please contact us by email with a description of what you are looking for. We will get back to you with search results as quickly as possible. Currently, we have auctions listed on eBay and post new auctions weekly. If you are a member you can shop with us there. You can also purchase from us directly. Email for payment options. All ads are packaged flat in oversized envelopes with plastic sleeves and cardboard reinforcement to prevent bending and damage. Insurance is available on all shipments, as we cannot be held responsible for items lost or damaged by the USPS. Thankyou for visiting our site, we will be adding more information soon.